MIAMI--(BUSINESS WIRE)--Ryder System, Inc. (NYSE:R), a leader in commercial fleet management, dedicated transportation, and supply chain solutions, announced today the expansion of COOP by RyderTM into South Florida. The truck sharing platform, the first of its kind for commercial vehicles, initially launched in Atlanta in March 2018. 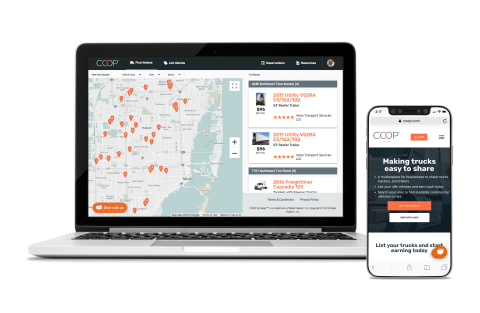 COOP allows fleet owners to safely generate revenue by sharing idle trucks and trailers while providing a new source of rental vehicles from a network of trusted peers. The digital platform is now available in South Florida and expected to be available within the entire state before the end of the year. COOP by Ryder™ is a commercial vehicle sharing platform that links fleet owners with idle vehicles to trusted businesses in need of rental vehicles. COOP’s mission is to make trucks easily shareable for everyone everywhere, affording fleet owners the opportunity to generate revenue from their idle vehicles and providing businesses with an alternative source of rental vehicles. For more information, visit COOP.com and follow COOP on Facebook and Twitter.